Urinalysis - This test is a combination of physical, chemical and microscopic tests. These tests help to identify and measure various substances in the urine, such as by-products of normal and abnormal metabolism, cellular fragments, bacteria, cells such as bilirubin, protein, glucose, crystals. This test is a great screening tool that helps identify several disorders in their early stage itself. The test requires no special preparation on your part. You just need to provide a sample of your urine. Serum Creatinine - This test is used to measure levels of creatinine in the blood. Creatinine is a waste product and high levels of creatinine indicate that the kidneys are not functioning properly. No special preparation is generally needed for this test. A small sample of your blood will be drawn and tested at a laboratory. Generally, serum creatinine levels of 0.7-1.3 mg/dL in men and 0.6-1.1 mg/dL is considered normal. Levels higher than this would mean that your kidneys are not functioning properly and you are at a higher risk for diabetes and other diseases. Urea - This test is used to measure the levels of urea nitrogen in your body. Urea nitrogen is a waste product that is usually filtered by the kidneys and leaves the body through urine. The presence of too much or too little urea could indicate kidney problems. This test is performed as a screening test and to monitor the progress of diabetes treatment. You don’t require any special preparation for this test. A sample of blood will be drawn and sent to the lab for testing. A level of 7-20 mg/dL is considered normal. Levels higher or lower than these can indicate serious problems including diabetes. Glomerular Filtration Rate (GFR) – This test is used to measure the rate at which the kidneys filter waste from the blood. No special preparation is needed for this test. A sample of your blood will be drawn and tested for creatinine levels. The creatinine level is combined with other factors and the GFR is calculated. Results in the range of 90-120 mL/min/1.73m2. Low levels indicate kidney disease. Prostatic Specific Antigen (PSA total) – This test helps to diagnose and follow prostate cancer in men. You don’t require any special preparation for this test. A sample of your blood will be drawn and tested. A PSA level of up to 4 ng/ml of blood is considered normal. For men aged 50 or younger, a PSA level of 2.5 is considered healthy. A higher PSA level indicates a higher risk for prostate cancer. Total Cholesterol - A Total Cholesterol test is conducted to measure the amount of ‘good’ and ‘bad’ cholesterol and triglycerides in your blood. Cholesterol is a soft, waxy fat that your body needs to function properly. Triglycerides, too, is a type of fat. However, too much of these can lead to diseases such as high blood pressure, diabetes and heart disease. This test can be prescribed for screening and to monitor treatment progress. To prepare for this test, you may be asked to fast for 9-12 hours before the test. During the test, a sample of your blood will be drawn and tested. The results will show your levels of total cholesterol, low-density lipoprotein (LDL), high-density lipoprotein (HDL) and triglycerides along with normal levels. If your levels are outside of the normal range, it indicates a higher risk of diabetes and other diseases. Complete Blood Count (CBC) – This test is used to screen for overall health and can also help diagnose a wide range of conditions from anaemia to cancer. No preparation is required for this test. A sample of your blood will be drawn and tested. Test results will indicate various cell counts such as red blood cells, white blood cells, and platelets. Depending on the range of cell counts, various conditions such as heart disease, infection, inflammation, bleeding disorders, autoimmune disorders, deficiencies of minerals or vitamins can be diagnosed. Liver Function Test – These tests help check the health of your liver by measuring levels of liver enzymes, proteins or bilirubin in the blood. Generally, SGOT/SGPT, Albumin and Bilirubin tests are recommended to test liver function. Similarly, a Serum glutamic pyruvic transaminase (SGPT), also known as alanine aminotransferase (ALT) is also conducted to measure enzyme levels in the blood. These tests are done to check for the healthy functioning of the liver. No preparation is required for this test. A sample of your blood will be drawn and tested. Generally, for SGOT 14-20 units per litre for men and 10-36 women are considered normal. For SGPT, 10-40 units per litre for men and 7-35 for women is considered normal. High levels of enzymes could indicate the risk of various diseases including diabetes. Serum Albumin – This test is used to measure the amount of albumin in your blood. No special preparation is needed for this test. A sample of your blood will be drawn and tested. Generally, a level of 3.4-5.4 g/dL is considered normal. Low levels of albumin can indicate various conditions including liver disease, inflammation, and malnutrition. 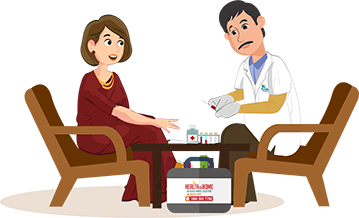 Total Bilirubin, Direct Bilirubin, and Indirect Bilirubin – This test gives a count of all three bilirubin levels in your blood. To prepare for this test, you will have to fast for 4 hours before the test. A sample of your blood will be drawn after the fasting period and tested. A direct bilirubin level of 0-0.4 mg/dL and total bilirubin level of 0.3-1.0 mg/dL is considered normal. High levels of bilirubin could indicate issues with your liver, bile ducts or gall bladder. At Apollo Clinic, we follow stringent protocols to ensure that all samples and test results are collected and handled with utmost professionalism.